Glasses Direct is now a major international brand, offering some of the best deals on glasses you’ll find anywhere. But back in 2004, it was a different story. Founder Jamie Murray Wells, who was a student at the time, discovered he needed glasses but wasn’t impressed by the prices he found in high street opticians. He decided to start his own online glasses business from his family’s house in Wiltshire. Within a couple of years, Jamie’s simple idea had turned into a major business, employing several staff and winning several awards in the process. Staffed by a dedicated team which includes qualified opticians, Glasses Direct are now market leaders in their sector, with a commitment to offering excellent value for money as well as impeccable customer service. With Glasses Direct, you’ve got a huge selection to choose from, helping you find the glasses you need, that are both stylish, and most importantly, affordable. How do I use my Glasses Direct discount code? Pay a visit to the Glasses Direct website by following the link from vouchercloud. Browse glasses on offer and when you’ve found the pair you want, click ‘Buy Now’. Choose what the glasses are for (e.g. for reading or distance) and click ‘Next’. Choose clear lenses, sunglasses, or adaptive lenses and click ‘Next’. Choose your lens type (eg scratch resistant, anti-reflection) and click ‘Next’. Enter your prescription if you have it. You can also add this later. To complete your purchase, login to your account if you have one, or create a new one. Enter your delivery and payment details and place your order. If you’re on a budget you can always visit the Glasses Direct sales page to see the latest offers. How do I order my glasses with Glasses Direct? It’s easy to order your glasses online. For step-by-step instructions, please see this handy guide. How can I get help choosing the right pair? Glasses Direct has lots of resources to help you make the right choice when purchasing your glasses. Please see this guide to start you off. How do I make adjustments to my glasses once I’ve received them? Please see Glasses Direct’s page on how to adjust the fit of your glasses. Glasses Direct, Gemini House, Hargreaves Road, Groundwell, Wiltshire SN25 5AZ. Standard delivery to anywhere within the UK is £3.95. Boutique orders and Home Trials packs come with free delivery. You can return your glasses within 30 days of purchase, provided the are still in their orginal condition. For further details please see their returns page. 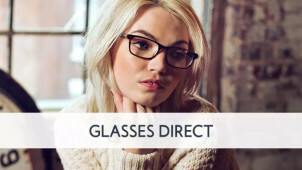 If you’re looking for a stylish new pair of glasses but don’t want to break the bank, check out Glasses Direct’s extensive range of men and women’s frames. As the premier online retailer of prescription frames in Europe, you’ll find designs here for less than high street prices. Why not make use of a Glasses Direct discount code and grab yourself a bargain on your new pair. With Glasses Direct, ordering high-quality frames online has never been easier. Not only does Glasses Direct offer a huge range of regular, designer and boutique frames and contact lenses to suit all budgets, you can also try out different pairs your like with a free home trial. That way, if you can’t decide which frames are the best fit, Glasses Direct will send you several of your top choices, you can see how the fit, and send the ones you don't want back at no extra cost. Getting ready for your next holiday and looking for a new pair of sunglasses to take with you? Glasses Direct can help with that too. Choose any pair of prescription glasses and you can turn them into sunnies by adding a protective UV tint. Use a Glasses Direct voucher when you’re having a browse for your next pair and you could put those extra pounds you save towards enjoying your holiday.